"100% Live Music - no backing tracks or loop pedals; just top quality professional musicians"
The addition of live music to your wedding can create a magical atmosphere, ensuring a truly memorable day for you and your guests and Violin for Weddings offers a unique choice for wedding ceremony music in Newcastle, Durham, Teeside, North Yorkshire and Northumberland. An unaccompanied solo violin can be romantic, atmospheric and expressive and is the perfect choice for both church and civil ceremonies. 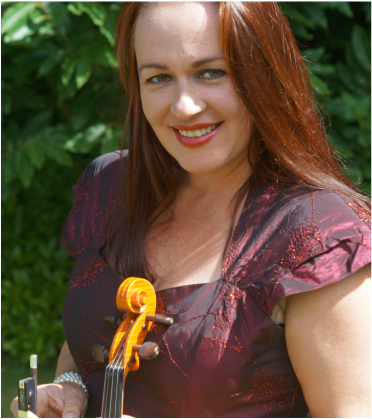 Emma is a professional violinist based in Durham and has more than fifteen years experience of performing wedding music at many of the North East's most prestigious wedding venues including Wynyard Hall, Lumley Castle, Matfen Hall, Beamish Hall, Headlam Hall, Healey Barn and many more. As well as being an experienced and talented performer, Emma also offers a friendly, efficient and professional service. Solo violin is so romantic and is perfectly suited to classical, folk, pop, religious, film & show melodies. It will sound wonderful in a church or castle; for a civil ceremony or even for an outdoor wedding. Have a listen to some of the videos on our website for ceremony music ideas including classical, film themes and Disney; pop, jazz and folk. For a fuller, more upbeat sound our violin and acoustic guitar duo is ideal and can perform for church & civil ceremonies and wedding receptions throughout the North East of England. For wedding receptions with a vintage theme, we have a 1930s/40s jazz trio or quartet playing Parisian style Hot Club Jazz - sure to get your guests' feet tapping and put a smile on their faces! Violin for Weddings are available throughout the North East of England including venues in Newcastle, Northumberland, Durham, Sunderland, Middlesbrough, Teeside and North Yorkshire and on request will also travel further afield. the aisle was a dream come true." "We both want to thank yourself and David for your perfect performance at our Wedding Ceremony." Have a listen to some taster videos to get an idea of the range of styles and songs solo violin can play for weddings!